Year after year, San Francisco’s remaining working-class community has bore the brunt of ever-increasing MUNI bus fares, declining reliability and safety, and sharp increases in traffic congestion and smog due to the privatization of the city’s transit system. Thus, SOMCAN’s transit justice campaign was initiated. “Transportation is an essential part of community planning,” said Mary Claire Amable, SOMCAN’s Transit Justice Organizer. “Without affordable, accessible, and dependable transportation, children, youth, families, and seniors will be unable to move throughout the city in order to live their daily lives. 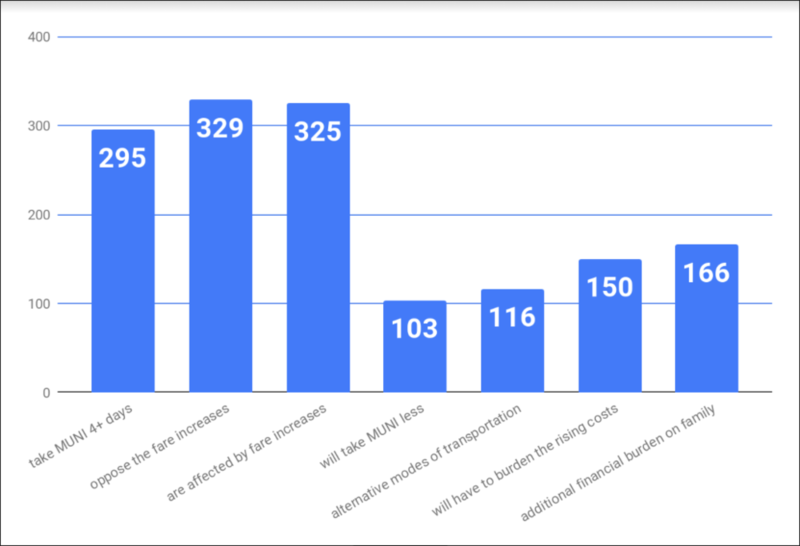 Dubbed “Bring Down the MUNI Fares!”, the nascent campaign is informed by ideas of equitable planning, in which the financial investment in transportation systems are carried out with the needs of the most vulnerable community members in mind. Some of the people most impacted by fare hikes include working-class adults who take the bus to-and-from their jobs, and City College students who do not benefit from free programs like those at San Francisco State University and University of San Francisco. Source: MUNI Riders Survey, SOMCAN, 2018. With the proliferation of ride-shares and corporate shuttles over the last decade, conversations of transit justice have been happening all over the city in the last year. Recent studies have shone on a light on the linkages between gentrification and environmental issues. In 2020, the San Francisco Municipal Transportation Agency projects fares to increase once again. Single-way cash fares will go up to $3, while the monthly Adult A pass rises to $102. If you are a concerned MUNI rider looking to get involved with SOMCAN’s transit justice campaign, please contact Mary Claire Amable at mamable@somcan.org or 415-255-7693.